February 24, 2016 – Engineers and technicians at NASA Glenn’s Plum Brook Station in Sandusky, Ohio, are preparing for the first major test in the campaign to verify the structural integrity of Orion’s service module for Exploration Mission-1, the spacecraft’s first flight atop the agency’s Space Launch System (SLS) rocket. 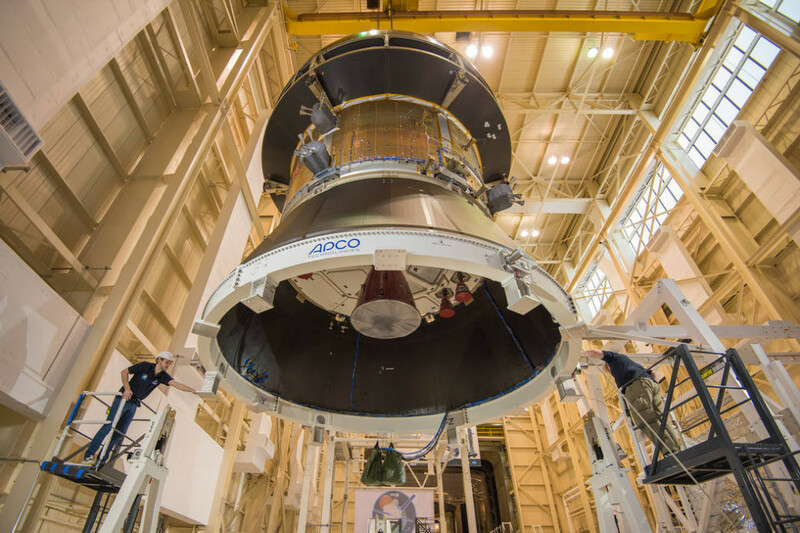 Orion’s service module, which will power and propel the vehicle and supply it with air and water, is being provided by the European Space Agency (ESA) and built by Airbus Defence and Space. On Saturday, February 20, an international team of engineers and technicians lifted and tilted the service module test article — which includes structural representations of the service module, crew module adapter, and spacecraft adapter — to a 90 degree angle to position it for the deployment test of one of Orion’s four solar arrays. The next step in preparation for the test is attaching the solar array before the February 29 deployment test. The solar array wing deployment test will verify that the qualification model wing unfurls as expected. This is the first in a series of crucial tests to verify the service module’s structural integrity and ability to withstand the dynamic launch environment atop the SLS rocket.